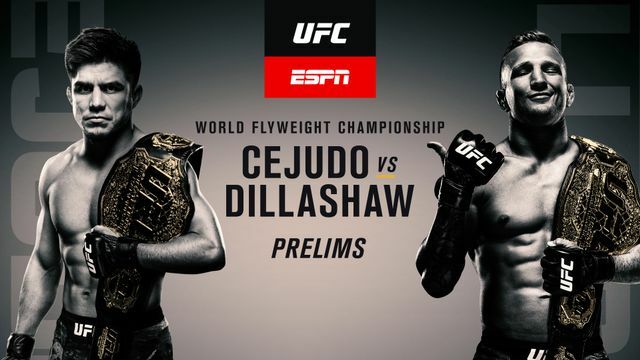 - As a result of the cancellation of UFC 233, a flyweight bout between former UFC Flyweight Championship challenger Joseph Benavidez and Deiveson Figueiredo was briefly linked to this event. However the following day, the promotion clarified plans indicating that the pairing was off and that Benavidez would be an alternate for the headliner bout in the event that either Cejudo or Dillashaw would be forced from the main event. On December 15, it was announced that despite still being an alternate, Benavidez would face Dustin Ortiz in a rematch. - A bantamweight bout between Thomas Almeida and Cory Sandhagen was briefly linked to the event. However on December 22, it was announced that Sandhagen would face John Lineker in the event instead. On January 10, Lineker was forced to withdraw from the bout due to a rib injury. He was replaced by promotional newcomer Mario Bautista on January 12. - Ion Cutelaba was expected to face former UFC Light Heavyweight Championship challenger Glover Teixeira at this event. However on January 10, it was reported that Cutelaba was forced out of the bout due to injury. He was replaced by Karl Roberson on January 11. - Randy Brown was expected to face Chance Rencountre, but pulled out in the week leading up to the event. Dwight Grant was soon announced as his replacement, but it was later reported that he was unable to be cleared to fight due to an "eye issue". Promotional newcomer Kyle Stewart was then announced as Rencountre's new opponent on January 14. That's NFL greg hardy right? He is gonna own most guys he faces in the UFC. Great win for Geoff Neal! All of my DK teams are already dead after the 4th fight. Too many losses already. Good news is, I went all-in on GambleMaster with Geoff Neal -175, so that's good. Now I'm just watching the next 9 fights for fun with nothing to gain. Menifield reminds me of Gokhan Saki in his UFC debut. Both guys started fast and only thew power strikes, and started to slow down. Saki's gas tank looked worse, but Menifield's striking skill is worse. Good thing for Menifield that his opponent was trash. I want Cerrone to win, but I think Hernandez is going to beat him. Cerrone looked great in this match-up!